The head of the Odessa Regional State Administration says he is fed up with Poroshenko's empty promises. The Head of the Odessa Regional Administration Mikheil Saakashvili stated his resignation on 7 November. He said he had never been lied to so much as in Ukraine, and got sick and tired of unfulfilled promises by President Petro Poroshenko. "A few days ago, they closed the Citizen Service Centre, which Poroshenko has solemnly opened before the local elections and said that reforms are irreversible. But later on, the members of his own faction initiated the adoption new regulations, which would not allow this center to work. 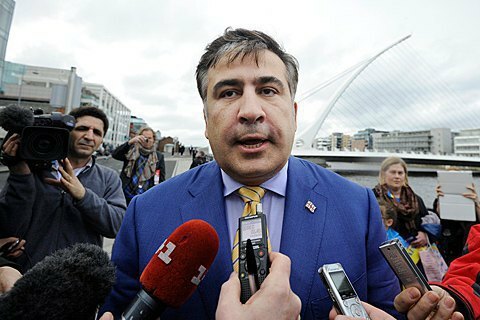 I have asked the President not to sign the law, but he signed it anyway, and the center was closed," Saakashvili said. The last straw, Saakashvili said, was electronic declarations of Ukraine's top officials with huge sums of cash. "We see that the backward forces attack all things progressive. We see that every new initiative is being nipped in the bud in front of the whole Ukraine. While I had to, to everyone's amusement put up tents along the roads along the roads and beg for financing to repair these roads, which have not been repaired for decades, they publish their declarations [of incomes and assets] with more money that needed to repair all the roads in this and other regions. It is not work, I'm sick and I'm tired," the governor said. "In this situation, I decided to resign and launch a new stage of the struggle. I will not give up," he said. Saakashvili said that the current government is not much different from the previous one. "What difference does it make for the Ukrainians as to who snubs them - Poroshenko or Yanukovych. What do Ukrainians care who robs them - Yenakiyevskyy or Kononenko. What do Ukrainians care as to who lays their hands on everything - some Kovalchuk or Klyuyev? Do Odessa citizens really care if Honcharenko, Presman, Kivalov keep looting and plundering them under the new administration," Saakashvili went on bitterly. "When we said that we will change everything, President Poroshenko said Yatsenyuk was in his way. We have created a movement for cleansing and helped him to get rid of Yatsenyuk. And what do we have? Yatsenyuk's people were slightly moved aside by the president's men, and the latter keep using the same schemes to loot and rob. Moreover, Avakov and Nasirov, two pillars of corruption, remained in their places," Saakashvili said. The governor admitted that, unlike "corrupt enemies of Ukraine" that enjoy that support of Poroshenko, he had no real power in the region. Earlier on Monday, resigned an ally of Saakashvili, head of the police of Odessa region, Giorgi Lortkipanidze .